“What do you want to be when you grow up?” is a common question to ask children. But what if, when you answered, you were told you couldn’t do that? And what if the fact that you couldn’t do it was because you were a girl? According to the U.S. Census Bureau, nearly 1 in 3 adults holds a bachelor’s degree or higher. 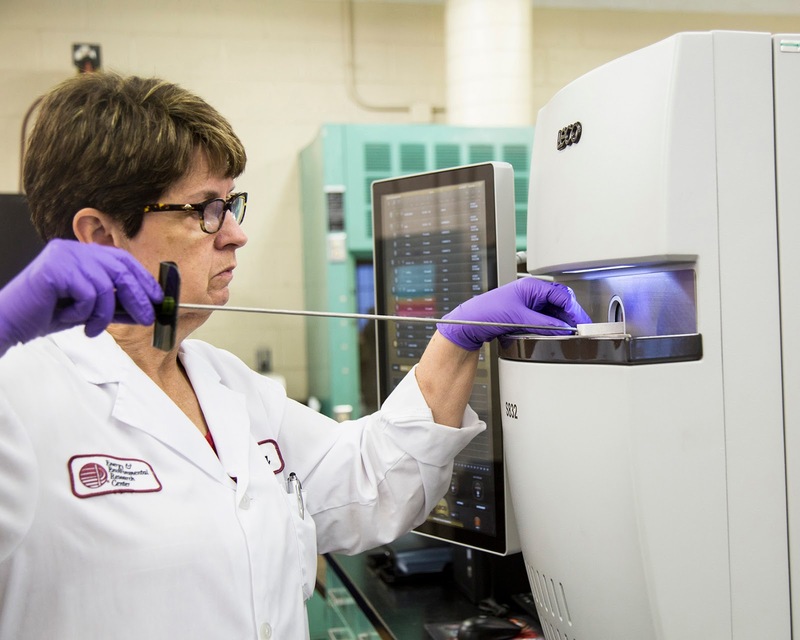 The National Science Foundation reports that 57.3% of bachelor’s degrees in all fields in 2013 were earned by women. While college degree attainment rates are higher for females, that is not the case within the STEM (science, technology, engineering, and math) fields. Women earn 17.9% of the degrees awarded in computer sciences, 19.3% in engineering, 39% in physical sciences, and 43.1% in mathematics. The Energy & Environmental Research Center (EERC) at the University of North Dakota in Grand Forks employs 174 full time people, 60% of whom have degrees in a STEM field and hold STEM positions. Of those degree-holders at the EERC, 17% are female. Experiences in childhood can greatly influence education and career decisions. The female scientists and engineers at the EERC shared their early experiences in their paths to earning STEM degrees. These women represent a full spectrum of backgrounds and generations. Some graduated from college in the 1970s, and others as recently as 2016. Answers to the question “What DID you want to be when you grew up?” varied from architect to interpreter to marine biologist. Even with their differences growing up across different generations, they all have one thing in common: at one point in their childhood, they were told science or math wasn’t for girls. Some of their experiences hearing this message weren’t necessarily deliberate. Others shared very direct messages they received in childhood. Despite these obstacles, these women all persisted in their interests in STEM education. They were encouraged by a female family member or were influenced by a story from another female they admired and found that positive reinforcement meant more than the negative messages. The weight of those supports was greater than deliberately oppressive statements from teachers (like being told “That’s not for girls”) or the lack of examples of women in STEM fields. While parents definitely influenced their pursuit of STEM fields, some of the EERC female scientists and engineers had encouragement or exposure through programs in which they participated, like Girl Scouts, science fairs, or advanced placement classes. Crossland’s mother was a Girl Scout leader who brought in speakers and took her troop on outdoor adventures that exposed them to camping, hiking, and science projects. Heebink participated in Math Counts and the science fair every year, and probably would have participated in additional programs had they been available to her in her small community. Kurz took advanced level honors classes in math and science, but kept it quiet. 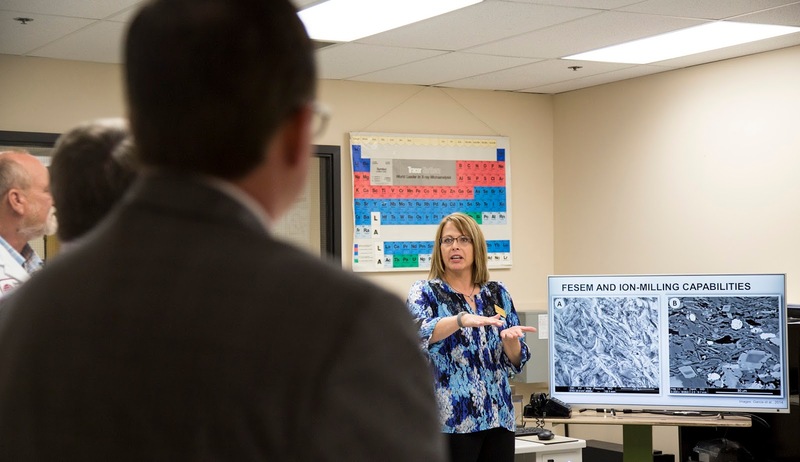 As one of the younger members of the EERC staff, Douglas noted that she is from the generation that grew up with science clubs and math meets being the norm. She even attended an engineering summer camp for girls. “I also had the influence of my older sister. She participated in all those things, and of course, I tried to be just like her,” said Douglas. Teachers also get credit for influencing decisions on careers and college majors in STEM fields, despite messages that they weren’t good choices for girls. All of these experiences, both positive and negative, led these women to their fields. In the face of obstacles and the lack of examples of women in STEM while they were growing up, they are now thriving in their careers at the EERC. All of them are now shining examples of successful women in STEM careers for girls today. 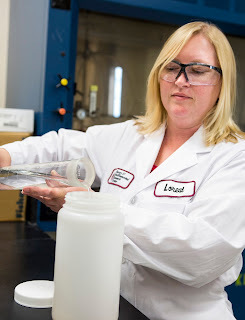 This article is the first in a series about women in STEM at the EERC. 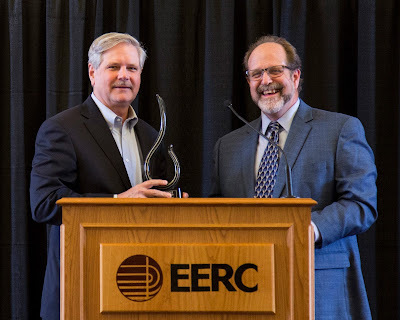 The University of North Dakota Energy & Environmental Research Center (EERC) presented its Energy Champion Award to the Honorable John Hoeven, U.S. Senator from North Dakota. The presentation and a reception were held at the EERC on August 21 from 1:00 to 2:30 p.m. 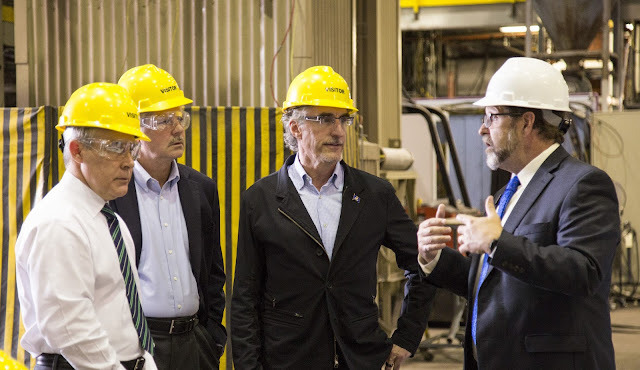 Senator Hoeven’s leadership, vision, and commitment to the state of North Dakota and to its energy industry throughout his career have kept North Dakota at the forefront of energy development nationwide. He was instrumental in the state being granted regulatory authority over carbon dioxide wells, known as Class VI wells, which will help advance carbon capture and sequestration technology. 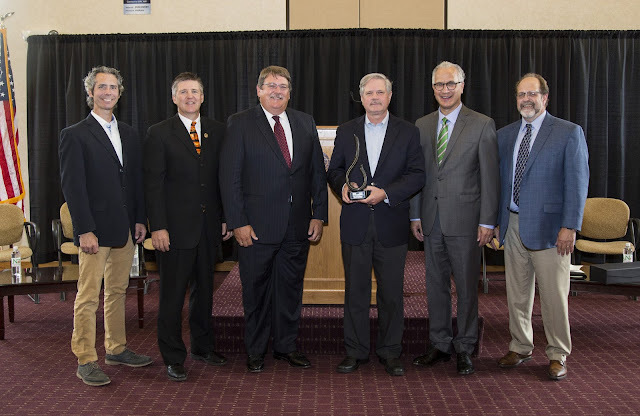 "Senator Hoeven has been a true champion of energy development in North Dakota," said Tom Erickson, EERC CEO. "This award is in recognition for his tireless dedication at the state and national level for advancing all forms of energy." "Through its work to help produce more energy with greater efficiency, the EERC is helping to advance the long-term energy security of our nation," Hoeven said. 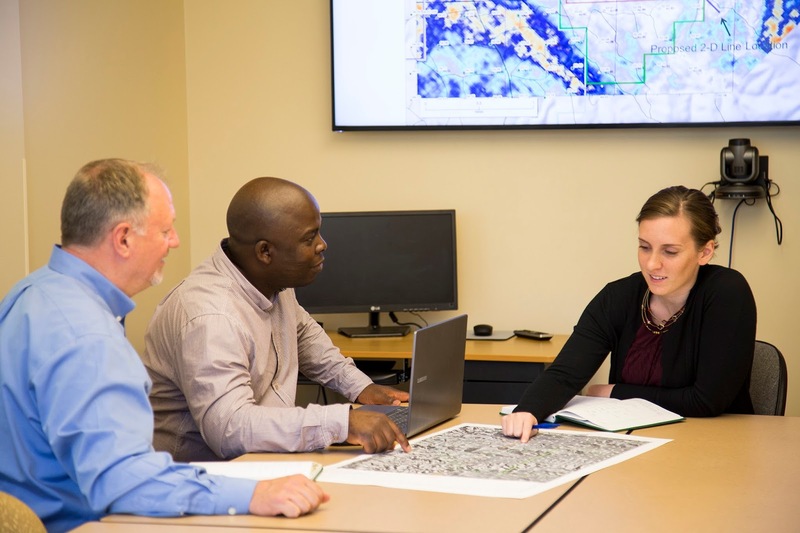 "The EERC continues to develop important initiatives like carbon capture and storage technology which will help North Dakota's energy industry produce affordable, reliable energy for many years to come. I am grateful to work with the EERC to support energy development in North Dakota and throughout our nation, and I am honored to receive this award." The Energy Champion Award was created in 1986 to honor individuals who have demonstrated extraordinary personal commitment to energy and environmental research and development. Senator Hoeven is the tenth recipient of the award. Past recipients are Michael Jones, Senator Byron Dorgan, Thomas Bechtel, Everett Sondreal, Thomas Clifford, Senator Kent Conrad, John McFarlane, Conrad Aas, and Senator Mark Andrews. Photos from the event are available here: https://www.flickr.com/gp/undeerc/V4vUM4. Speakers left to right: Lignite Energy Council President and CEO Jason Bohrer, North Dakota Petroleum Council President Ron Ness, EERC Vice President for Strategic Partnerships John Harju, Senator Hoeven, UND President Mark Kennedy, and EERC CEO Tom Erickson. U.S. Environmental Protection Agency Administrator Scott Pruitt, U.S. Senator John Hoeven, North Dakota Governor Doug Burgum, and EERC CEO Tom Erickson. Photo by Kari Suedel. The U.S. Environmental Protection Agency Administrator, Scott Pruitt, stopped at the Energy & Environmental Research Center (EERC) on August 9. EERC leadership staff provided a brief tour of the facility. The group discussed the carbon capture work occurring at the EERC and the need for driving down the cost of carbon capture technology. 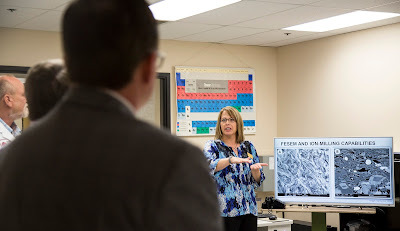 They also discussed the state-of-the-art equipment and analysis in the Natural Materials Analytical Research Laboratory at the EERC and how this fundamental scientific work is unlocking the potential in the Bakken formation. Mr. Pruitt's visit included a roundtable discussion, where he heard remarks from North Dakota energy and environment leaders, as well as lawmakers. Governor Doug Burgum, U.S. Senator John Hoeven, and U.S. Congressman Kevin Cramer were also in attendance. Mr. Pruitt's visit to North Dakota was coordinated through the Office of the Governor as part of the Environmental Protection Agency's State Action Tour. North Dakota has a strong team of industry partners, state organizations, and universities dedicated to a more prosperous, cleaner, and brighter energy future. We are working with regional partners to advance technology to support an all-of-the-above approach to energy production, developing more synergies between energy and agriculture and a stronger, value-added approach to resources. Our new resource, "North Dakota's Energy Future," details seven goals developed as an outcome of our 2nd Annual Partnership Summit, which was held in June. Download and print your own copy of "North Dakota's Energy Future" or contact EERC Communications Director Nikki Massmann for a digital copy.